Patchy early black ice, then a mild breeze and fair. Highs in the 40s. Overnight Tuesday: Partly cloudy, lows in the 30s. We have some leftover icy spots early this morning, but with a better chance of sunshine and temperatures well into the 40s, is the warmest day we've had in some time. Wind increases from the southwest gusting past 25 mph during the afternoon, adding a bit of a chill. The next front is not far away. A cold front sweeps across the region tonight, with a few snow showers in the higher elevations. Low temperatured by early tomorrow in the 20s north and 30s south. Tomorrow should end up being mostly sunny with temperatures holding in the 30s south, and 20s north. Wind from the northwest will be gusting 20 to 30 mph by afternoon. High pressure from Canada is right over us tomorrow night, with a clear sky temperatures will dip to near 0 degrees in northern New England to 20 degrees near the south coast. Thursday looks quiet and cold with a good amount of sunshine a high temperature in the 20s. A more powerful system is going to approach from the Midwest on Friday, with increasing clouds and a chance of wintry precipitation developing by afternoon. 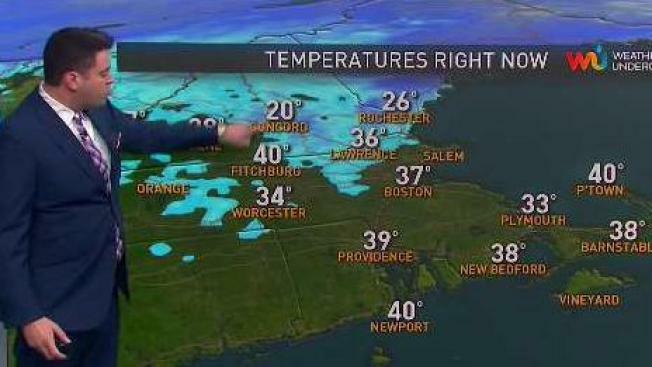 Snow and freezing rain are possible in northern New England, and a few rain showers are possible south, with a high temperature near 40 degrees. The early call for the weekend is for low-pressure to track well to our west, with an swath of warmer air and rain showers likely Friday night and Saturday. The timing is still difficult to pin down, but it this point it looks like we are on the warm side of the front most of We'll see rain on Saturday, wind from the south, with a high temperature in the 50s to near 60 degrees. There is a serious boundary between warm air in New England, and much colder air across New York in Ontario by Saturday night. That colder air will likely return for the second half of the weekend, with additional storminess possible. The early call is for seasonable chill and mostly dry Christmas Eve, then a better chance for snow and ice and rain on Christmas Day. Of course we will fine-tune as it gets closer!